Joe Quesada, the Chief Creative Officer for Marvel Entertainment, had some interesting things to say about Man of Steel on Kevin Smith's Fatman on Batman podcast. I wanted to love it so much, and I didn't love it so much. Again, there are little things here and there that you could pick at and things like that, but I just think at the end of the day, Zod was the hero of the movie to me. Quesada's argument for this is that Zod only wanted to be able to rebuild Krypton and Superman was standing directly in his way. He went on to explain about Zod. he had his orders, he had a mission. He was a zealot of sorts, but he was a zealot…again, correct me if I'm wrong… but he didn't say, 'I want to rebuild Krypton, and then come back and destroy this little planet. All I want is to rebuild this planet. And the only reason I'm blowing everything to bits here is because you've got what I want, and you're not giving it to me. So please, give me my people, and I'll leave. 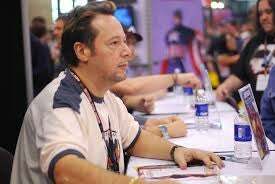 Now certainly no one expects Joe Quesada to sing the praises of a rival company's movie, but does he have a point? Or is he just being a homer for Marvel?